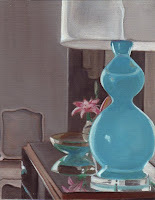 Being the proud owner of 2 pretty turquoise lamps (courtesy of a rockstar find at Heritage Trail Mall on Ridge Road in Wilmette), I was inspired by a Jan Showers advertisement to paint this little vignette. I have mine framed in a vintage wooden frame and recently completed one for a friend who had admired it hanging in my kitchen. Cannot get enough of the colour turquoise and truly love the combination of pink and turquoise.